You'll be £6.00 closer to your next £10.00 credit when you purchase Dien Bien Phu. What's this? At the end of the Second World War France sought to reassert its military prestige, but instead suffered humiliating defeat at Dien Bien Phu in French colonial Indochina. The First Indochina war became a textbook example of how not to conduct counter-insurgency warfare against nationalist guerrillas. Anthony Tucker-Jones guides the reader through this decisive conflict with a concise text and contemporary photographs, providing critical insight into the conduct of the war by both sides and its wider ramifications. The Viet Minh, after resisting the Japanese in Indochina, sought independence for Vietnam from France. The French, with limited military resources, moved swiftly to reassert control in 1945, sparking a decade-long conflict. French defence of Hanoi rested on holding the Red River Delta, making it a key battleground. When the Viet Minh invaded neighboring Laos the French deployed to fight a set-piece battle at Dien Bien Phu, in 1954, but instead were trapped. All relief attempts failed and French defences were slowly overwhelmed. America considered coming to the garrison’s rescue using nuclear weapons, but instead left it to its fate, which set the scene for the Algerian and the Vietnam conflicts. France’s reluctance to relinquish her vast 19th century empire in South East Asia and Africa saw events culminate at Dien Bien Phu. In March 1946 the French Expeditionary Force moved into North Vietnam (Ho Chi Minh having established the Democratic Republic of Vietnam in September the previous year). Ho had established the Viet Minh with militia (village), regional troops and the Vietnam Peoples’ Army (regulars) supported logistically by Chinese Communists. The French, were alone in waging a war unpopular at home, and virtually unsupported by the US and UK. The January ’51 battle for Red River (Hanoi and Haiphong), despite being won by the French, illustrated potential problems they would face at the Viet Minh continued to gain strength both numerically and logistically. The French concentrated on strongpoints based on cities, and did not attempt to control the intervening countryside, and the strategy of using paratroop battalions without adequate logistic ground and air transport led to the final demise of the French at Dien Bien Phu on 7 May 1954. The text consists of short chapters dealing with all aspects of the period. A coloured insert includes a map of French Indochina, French aircraft, weapons and decorations and Viet Minh weapons and decorations. Both the French and Viet Minh order of battle at Dien Bien Phu are Appendices, and a brief Bibliography complete the work. The on flow of the Viet Minh victory over the French was the Second Indochina War (better known as the Vietnam War (1 Nov 1955 – 30 Apr 1975). Anthony Tucker-Jones has written a clear and concise description of the attempt by France to retrieve French Indo China, lost to Japan during WWII. General Charles de Gaulle's view was that the loss of Indo-China would spell the end of the French Empire, in fact it was lost when France, surrendered to Germany in 1940. Indo-China, its empire in the Orient, was almost 20,000 miles from Paris and easy prey for Japan. On 24 August 1943 Britain formally recognised de Gaulle's French Committee of National Liberation as responsible for all French Oversea Territories. America didn't recognise de Gaulle's team as the Government of France nor did it accept, that overseas territories administered by pro-German French Vichy Government, should be returned to France after the war. The British Special Operations Executive (SOE), trained and parachuted French agents into it Indo-China to create and arm local resistance groups. The American OSS did similar but it only supported communist resistance groups, and these hunted down and murdered the French agents and their nationalist groups. French agents parachuting into Indo-China considered themselves lucky if they were captured by the Japanese. In March 1945 the Japanese, based in Indo-China, carried out a coupe arresting and murdering thousands of French officials and resistance groups. While the OSS watched, the French resistance was destroyed. The French army was put on the alert, and its Generals, Alessandri and Sabattier together, concentrated 10,000 troops in west Tonkin around the airfield Dien Bien Phu. Pleading to the Americans for help, they fought off Japanese to attacks. The US General Wedemeyer response was an order to all American forces in Indo-China that 'no arms and ammunition to be dropped to the French troops under any circumstance'. The Americans and their communist resistance groups in the hills sat back and watched events unfold. Out numbered and out-gunned, the French carrying their weapons and wounded, retreated into captivity in China. By this time the Vichy Government in France had collapsed and was replaced by General de Gaulle. When Japan surrendered in August 1945 the communists resistance groups and their OSS advisors seized control of all major cities. On 2nd September Ho Chi Minh with OSS Colonel Patti at his side declared Vietnamese Independence. US General Gallagher with the American Military Mission in Hanoi believed that there was no question of Indo-China being restored to France. As Anthony Tucker-Jones relates America's intention was not to support the French and British Asian empires but the global threat of communism and the Domino Theory that if one Asian country became communist the rest would follow, led it to commit over billion dollars in equipment weapons and airpower to the French military in Indo-China and more again later to the US backed South Vietnamese Army. The French military losses in the First Indo-China war, 1946-1954 was 55,000 killed: in the twenty years that followed American losses 58,220 soldiers killed. 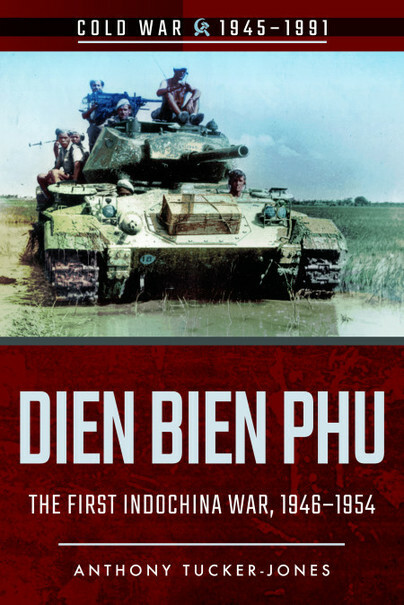 Anthony Tucker-Jones's 'Dien Bien Phu, The First Indochina War, 1946-1954' is very readable introduction to students and others to the war which was overshadowed by America's War in Vietnam.